When we do something for our students, it makes a lasting impact. Whether we attend one of their sports games, talk about a movie they have seen or give them a trinket, it helps make that connection so much stronger. 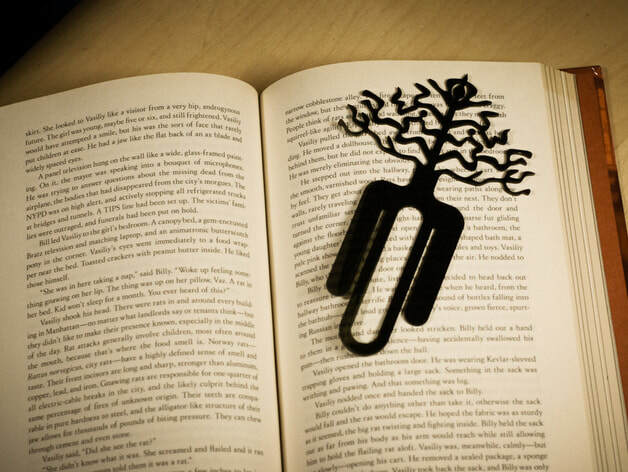 Here's a way to make that impact plus show them that reading matters: 3D print bookmarks for your students! In the previous post, I mentioned how to start the year off with student names tag/plates that were 3D printed. 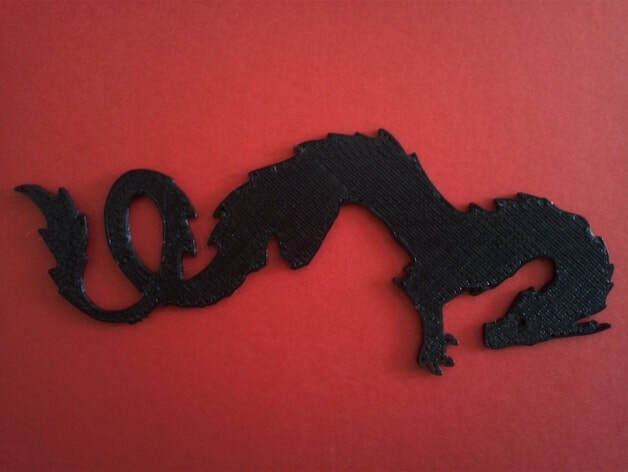 That post also shows how to get started with 3D printing, so please see that page on how to get started. 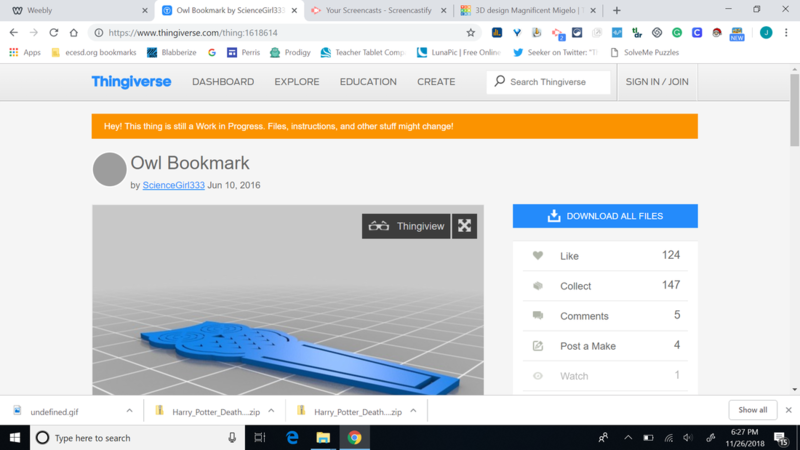 In this post we will look at how to 3D print a bookmark, then how to take an existing bookmark and manipulate it as a custom bookmark. Let's get started! The place you will want to start is a website called Thingiverse and the link below already has the search completed for you. Click it! Once there you will want to find a model that you find interesting. 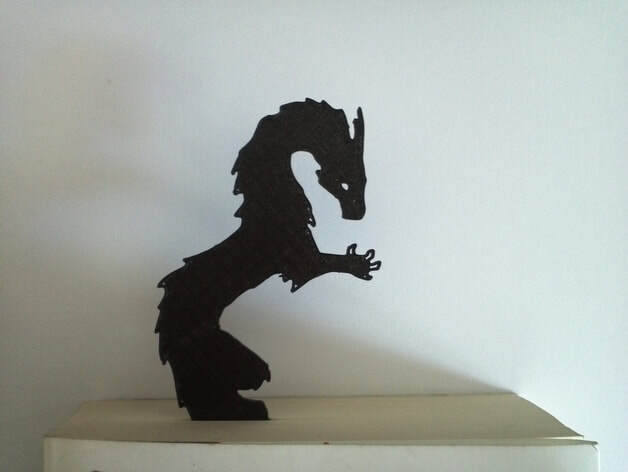 I'll choose this dragon bookmark. Once you click to download the file you will see it in zip form, open it up by clicking on it. Inside your are looking a 3D model file or STL file type. Once you have found it, double click on it to launch the printer software. Some of these may be too long for your printer, so just double click the model and resize it. The cross hairs on the right side will allow you to recenter the model. Now it's ready to be printed! See the video below for a visual companion to these instruction. 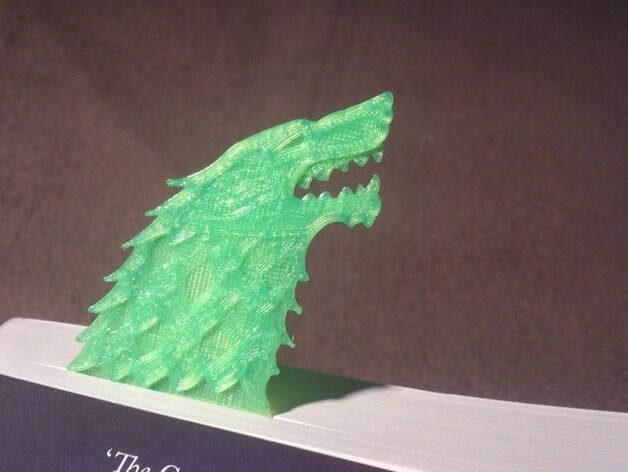 Here are some examples of printed bookmarks! What if I or my students want to make our own? Let's see how we can get this made! First you want to find a preexisting bookmark that you will manipulate. I have included the one below as a great example! Click the picture to go to the site! Next you will want to download the file, open it and place it in a separate folder. 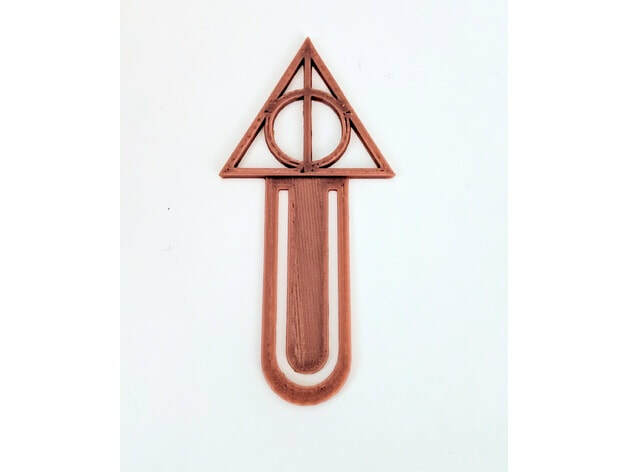 Now go to www.tinkercad.com and create a new design. From there you will import the bookmark file so that it can be manipulated. Now we will cut away a piece of the bookmark by selecting the block that is clear. We will place it over the part we want to remove. We can change its size by dragging on the squares around the shape. Once we have the area covered we want to cut away, we will drag and highlight everything. Then we will click on the group button. After a few seconds it will be cut away. Now let's find something to attach to it! I have included an example below for you to try out first, so please click on the picture! We will click to download the file and place it in the same folder as before. Then we will go ahead and import it like last time! Sometimes the item will be too big, so let's change the size by using the cubes around the object. This will allow us to make it small enough to fit with the bookmark piece we have leftover. Once it's the size we want, we move it so it touching the bookmark piece, highlight everything and then click the group button! The last thing is to export our new bookmark, open the file and then set it to print! Click the export button, choose STL and when it downloads just click it open. This should open it in your 3D print software and you are ready to go! 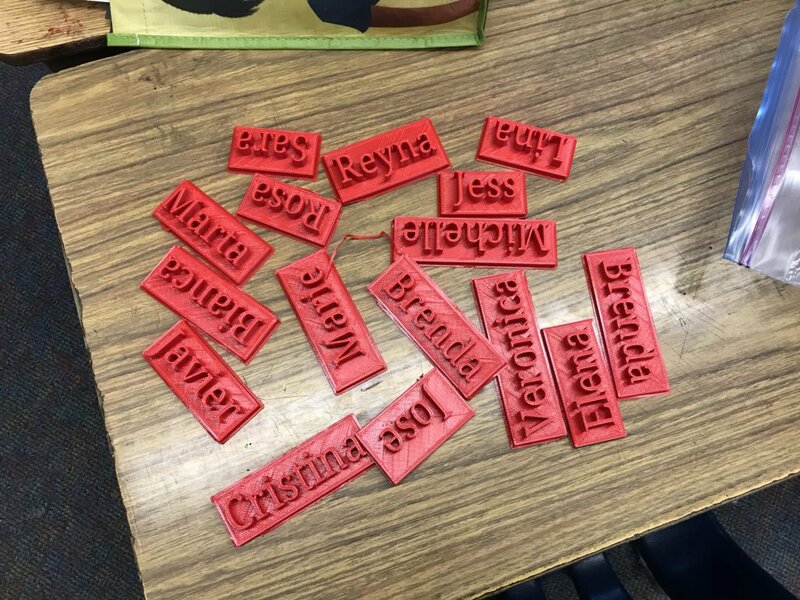 While this may take much, much longer than writing names or having the student decorate their own name tags, there are many hidden benefits to creating 3D printed name tags. You will create a sense of wonder by giving your students something they can hold in their hands, created specifically for them and that they can take home to mom and dad. You will also build curiosity in your classroom because the first thing students will ask is how did you do this or if THEY have a 3D printer in the classroom. This is huge and will lead to conversations about what else can be created. 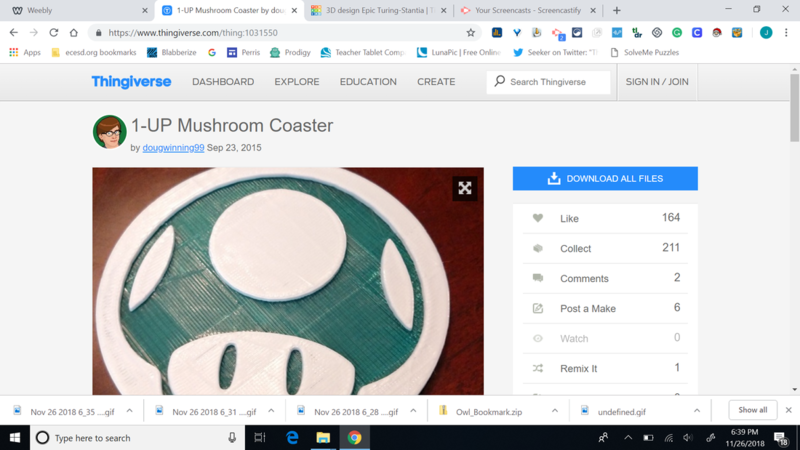 You can then build off of this by showing videos related to 3D printing, having other items to pass around the class and having the 3D printer running when students walk in the first day of class. From this simple gesture you will be able to leap frog into design challenges, incorporating 3D printing with projects and so much more. Having a 3D printer (or more, but I’ll address this later) doesn’t mean it has to break your bank. You can start printing in your classroom for less than $400! While searching for 3D printers, you may see some that are able to print bigger or have extra options but you won’t need anything too high end for an elementary classroom. I use the Monoprice V2, it runs for $189 and comes out of the box ready to go. The only thing you need to do is attach the side arm where the filament will be hung and remove the white packing tape one some of the components. This is the plastic that is fed through the printer, melts and creates the objects! 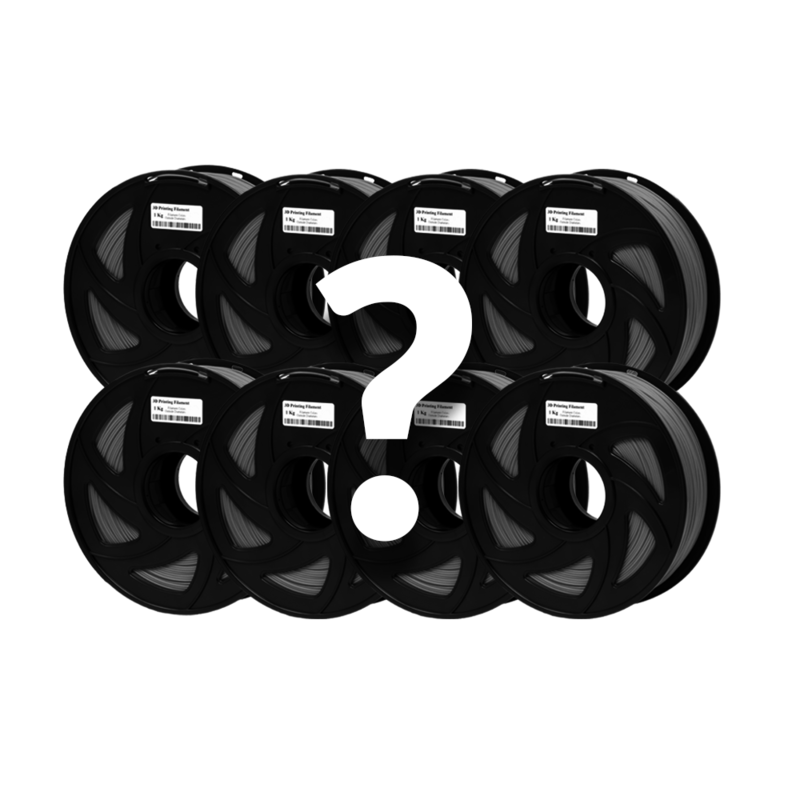 I use PLA filament because it is odorless, strong and inexpensive. A roll of PLA on Amazon can run around $20 but a great place to get some is through Zyltech. They offer a grab bag of eight rolls for $90. In order to run the software that will print out the name plates (and future creations) you will need either type of computer. There is no reliable way to set prints with a Chromebook at this time. The first thing you will want to do is get the filament loaded. Once you have removed the filament from the box and its plastic packaging, you will want to cut off the end that has a kink in it with a pair of scissors. As you see below, it will be just a little length that you need to cut. You’ll want to put the filament on going in this direction, which will allow the machine an easier time feeding the filament. Don’t feed it through just yet but place it in just a bit so you have it ready. Now look on the back and flip the red switch to turn it on! Next push the build plate back, it will move freely when it is not printing. Using the dial and rotate it to the right so that you are on the preheat setting in the center. Now you will want to click on the dial, as it acts as a button also. After you have clicked in the button you will have another menu popup and here you will go ahead and click again. It will already be set to nozzle, which is what we want to preheat. Click in the dial again. Now you will want to rotate the dial to the right and get it to 230 degrees. Once there, click the dial again and it will be set. Now rotate to start preheat and click the button again. 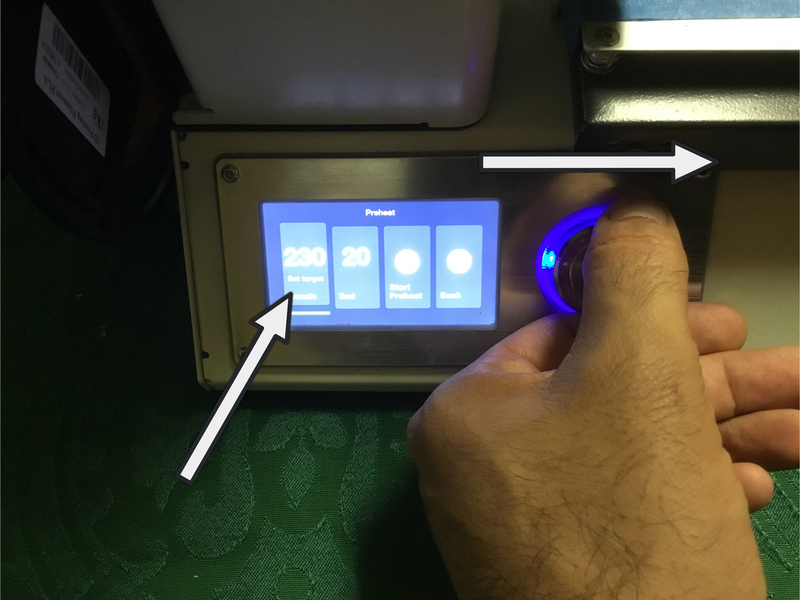 Once it reaches 230 degrees, go to the top and push in the lever so you can feed the filament to through the tube. Keep it squeezed in and push till it gets through the end. You might feel a spot where it gets stuck but push a little harder since there is a lip it needs to go over. Push the filament till you get a little gob of filament to come out. The next step is to take out the micro SD card on the side and connect it to the computer with Simplify3D installed on it. You will also return the micro SD card to the same spot to select the model that you will print later. Okay, great now the filament is loaded! Now let’s make some student name tags! Let’s head over to a great design site called Tinkercad by clicking on the logo below. See below on how to log in using your google account. Once you have created it, skip the tutorial by clicking on the tinkercad logo as seen in the video. Now we will get the name of a student typed up. Scroll down on the side and you will see the text block. Click on it and then click on the design area, which will place the block. Then there is a field to type in a name or whatever you would like. See below for a video walk through. If the name is printed just like this, the letters will come loose, so we will need to have a plate underneath the letters. See below for a walk through on on to place a plate and how to manipulate blocks. Now we need to take the file out so it can be printed. Click on export and select STL. The file will then be downloaded onto your computer. 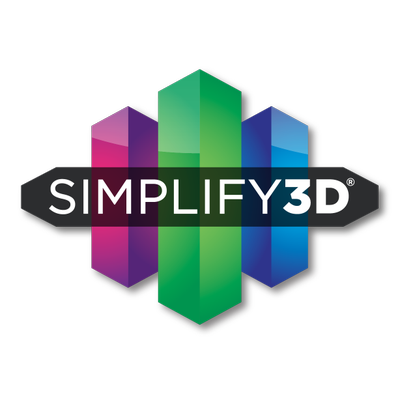 Click on the file to open it and it will launch the Simplify3D software. If you have a previous model there, just click on the name of it and hit backspace to remove it. Once the file is loaded, you can change the size of the model by double clicking it. Changing the size will change how long the print will take. When you click on the edit process settings button, there are various options. Click on the quality drop-down button and choose the quick setting. The quality will still be great at this setting. Now you will click on prepare to print and you will see how long your print will take. Finally click on save toolpaths to disk button and select the micro SD card to save it for printing. the card but the first few times you should see the file you are looking for right away. Find the file and click on the dial to select it to print. Once the item has been selected you will rotate to the right and select the speed option. Click on the dial and and then rotate to the right and set the speed to 2.0. This will make the print go faster and for most prints it will not affect the quality of the print. Use the provided tool to lower the build plate. Once you have lowered it a bit, set an item to print. Watch it print and see if it makes enough contact. It should look something like the example below, where it adheres to the build plate. You will need to stop some prints and adjust the build plate by rotating left to raise it up for better contact with the nozzle. This will take time because you need to adjust it just a bit and gradually get there. Once you get that first print done, you'll be all set to making a collection like these for your students!